The contemplative mind, attempting its return to divinity, is constantly dragged back toward the senses by the life currents. When the energy can be coaxed to reverse its flow from the senses to the brain, it reveals to our consciousness another world. A world — not of matter but of Spirit. Every person has a positive magnet at the top of the head (the spiritual eye and crown chakra), which pulls our consciousness upward toward our innate oneness with God. At the same time there is a magnet at the base of the spine that pulls us toward negativity, selfishness, and unawareness. The French have a phrase, nostalgie de la boue, nostalgia for the mud — in other words, our longing to return to the less aware state from which we’ve evolved. Kundalini, centered at the base of the spine, is the outward thrust of our consciousness that is identified with matter. This storehouse of energy is what pulls our mind toward restlessness when we meditate. True inner religion is reversing the life force away from its lair at the base of the spine and uniting it with the positive pole at the top of the head. When this union happens, enlightenment occurs. Some seekers, hearing how important raising the energy is, use violent breathing exercises and other intense practices to shake loose the life currents. Kundalini is a great power, however, which like fire, if misused or mishandled, can be extremely harmful. Over-stimulating Kundalini by too physical and willful means generates tremendous heat in the body and can damage the nervous system. In his book,The New Path, the founder of Ananda begins his chapter on Kriya Yoga — the highest technique for awakening Kundalini — with the following words from the Bible: “Blessed are the pure in heart, for they shall see God.” There is a good reason why every spiritual tradition encourages students to follow moral precepts — doing so puts them in tune with their Godly nature. Whenever we think generous or loving thoughts, energy is released upward, while any personal desire draws Kundalini downward in order to fulfill that desire. Yoga’s purpose is redirecting the life force up the spine. To achieve this lofty goal, our outer life has to reinforce our meditative efforts, otherwise, contractive attitudes bring our life force downward and opposite to where we are trying to go spiritually. 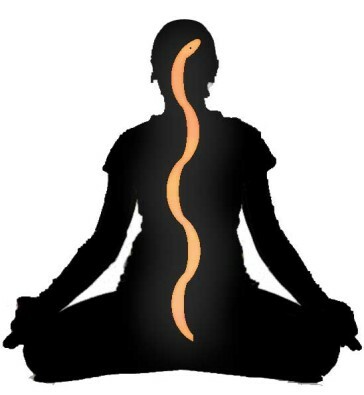 Kundalini can be likened to a large river: If one’s motives are right, Kundalini is drawn up safely through the inner spine, just as a river follows its natural channel. However, if a seeker motivated by ego forces Kundalini upward by extreme breathing exercises, his consciousness isn’t internalized and refined enough to allow the energy to flow freely in the spine’s deep channels. This forced energy has to flow somewhere, and as it does, it can damage the nervous system, like a river overflowing its bank. Yogananda strongly discouraged using intense yoga practices and taught a balanced and spiritually mature approach to enlightenment. His path of Kriya Yoga is completely safe and doesn’t force Kundalini so problems to the nervous system don’t occur. Yoga techniques are marvelous for stimulating the life force, but they have to be used in a broader context. Combining purity of heart and right attitude with scientific technique makes for a united and total effort. When yoga is practiced in a loving spirit of self-offering, the life currents are released upward harmoniously in a safe, yet powerful way. Email us if you would like to learn Kriya Yoga or find out more about it.